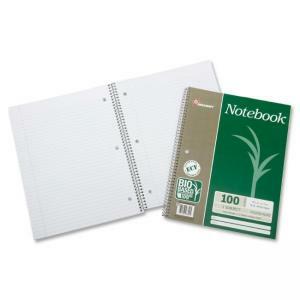 Single-subject, wirebound notebook is made from bagasse paper, a renewable, recyclable and compostable resource derived from sugar cane. 16 lb. paper is made using an Elemental-Chlorine Free process (ECF) and comes from a certified Forest Stewardship Council (FSC) certified mill. Environmentally responsible, soy-based ink is used for rulings. The notebook cover and sheets are three-hole punched for insertion into standard-size, three-ring binders. Each college-ruled sheet features a red margin.